Wolverhampton Wanderers lost more than £1m a week during their Championship-winning campaign last season. Wolves recorded a pre-tax loss of £57.16m for the year ending 2017-18, more than double the £23.18m they lost in the previous 12 months. However, the club were promoted to the Premier League as title winners in Nuno Espirito Santo's debut season as manager. They also turned over £26.4m and had an increase of £1.3m in ticketing income. In a statement on the West Midlands club's website, the pre-tax loss was attributed to increased expenditure on players, wages, and promotion bonuses. Some of those signings include player of the season Ruben Neves and the loan acquisitions of Diogo Jota and Willy Boly. "Wolves' owners are committed to continuously improving the club, from both a footballing and wider operational and strategic perspective," said the statement. 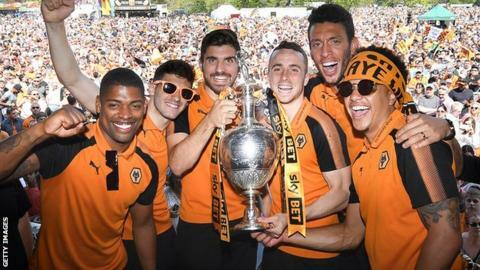 However, Wolves are showing no signs of a reduction in spending and the club have already spent £109m on players since being promoted to the top flight.